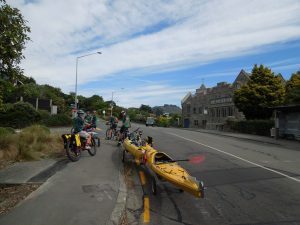 We left some of the bikes at Purau and the kayakers walked down to the boat ramp while the bikers towed the kayaks down the hill. The kayakers set off with the Nor-West still blowing vigorously and enjoyed an outgoing tide. They didn’t linger too long exploring bays on the way out in case the wind got stronger and made the heads dangerous, but as it turned out the wind dropped as the day went on and they arrived at Port Levy in less than 4 hours. The cyclists slowly ground their way up Port Levy saddle with the empty trailers and a little gear on board and enjoyed a walk up the Monument. 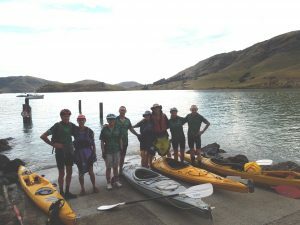 After an enjoyable blast down the hill into Port Levy they were surprised to meet the kayakers walking up the road. The expectation was around 6-7 hours paddling, not 4 hours. A quick shuttle of the kayaks was made 2km up the gravel road to another friend’s house where we had a much-appreciated Devonshire tea and a tour of their garden. To add a forth sport into our multisport schedule we biked around to the Port Levy Jetty for a dive off the wharf and a swim. The paddlers & riders swapped over and enjoyed a relatively still and sunny start to the day. The kayakers stopped in at Little Port Cooper for a look at the old school house and again made good time with a rising easterly tail wind helping them into the harbour. 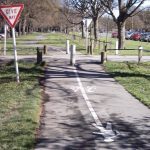 The riders in the other direction also made a detour up the Monument.The spare bikes were retrieved from Purau and everyone cycled over Gebbes Pass and home with a stop at the Blue Duck for ice creams. 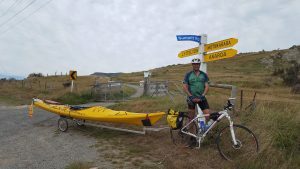 It was a very enjoyable weekend outing and it is likely we will choose another bay on Bank’s Peninsula to explore by bike and kayak next summer so let Steve know if you want to join in steve@cycletrailers.co.nz.